Pope Francis has celebrated Mass in Cairo for about 15,000 believers on the final day of his visit to Egypt. 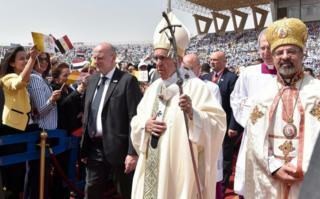 The worshippers gathered in a stadium, waving flags and releasing balloons as the Pope made his entrance. His visit comes three weeks after the so-called Islamic State (IS) killed at least 45 people at two Egyptian churches. The Pope has used the visit to build ties with Muslim leaders and appeal for religious freedom. For a Christian community that has felt under siege, and for a nation in the midst of three-month state of emergency, today&apos;s Mass was a rare opportunity to worship and celebrate in the open-air at Cairo&apos;s Air Defence Stadium. Pope Francis, who was rapturously welcomed, circuited the stadium in an unprotected "popemobile" before processing with a large group of local clerics toward the stage. He began his brief address in sombre mood, referring to the condition of the disciples following Christ&apos;s crucifixion. He said they returned "full of despair and disappointment… The Master is dead, and thus it is pointless to hope. They feel disappointment and despair". But he said their lives were transformed by the resurrection. And then he returned to a theme that he has repeated throughout this visit, that only those who behave with compassion can truly claim to be believers - believers of any religious faith. "God is pleased only by a faith that is proclaimed by our lives, for the only fanaticism believers can have is that of charity. Any other fanaticism does not come from God and is not pleasing to Him." His words were a deliberate echo of what he said at the historic al-Alzhar University, where he spoke largely to Muslims and argued that "We have an obligation… to expose attempts to justify every form of hatred in the name of religion". Pope Francis has laid down a challenge to both Christians and Muslims in Egypt to be fanatical about their faith, but in a way that leads only to engagement and compassion.